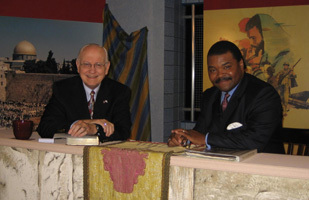 Dr. David R. Reagan serves as the Senior Evangelist for Lamb & Lion Ministries. He is a native Texan who resides in a suburb of Dallas. He is married and is the father of two daughters. His wife, Ann, is a retired first grade teacher. They have four grandchildren and one great-grandchild. Dr. Reagan is a Phi Beta Kappa graduate of the University of Texas in Austin. His graduate degrees were earned in the field of International Relations from the Fletcher School of Law & Diplomacy of Tufts and Harvard Universities. Dave — as he prefers to be called — was the founder of Lamb & Lion Ministries in 1980. Before entering the ministry he had an extensive career in higher education which included the following positions: Assistant to the President of Austin College in Sherman, Texas; President of South Texas Jr. College in Houston; Director of Pepperdine University's Center for International Business in Los Angeles; and Vice President of Phillips University in Enid, Oklahoma.